One afternoon close to Christmas, I was running away from the massive holiday shopping crowds in the center of Milan and found myself in front of a beautiful red brick tower rising above a gate and surrounded by old thick walls. Being strikingly tall it could be seen from many points near the Duomo Cathedral but I never knew what it really was until that day – the central tower of Sforza Castle. Moving on through the entrance I roamed around a huge rectangular courtyard in the heart of the Sforza castle and took some time reading the labels. 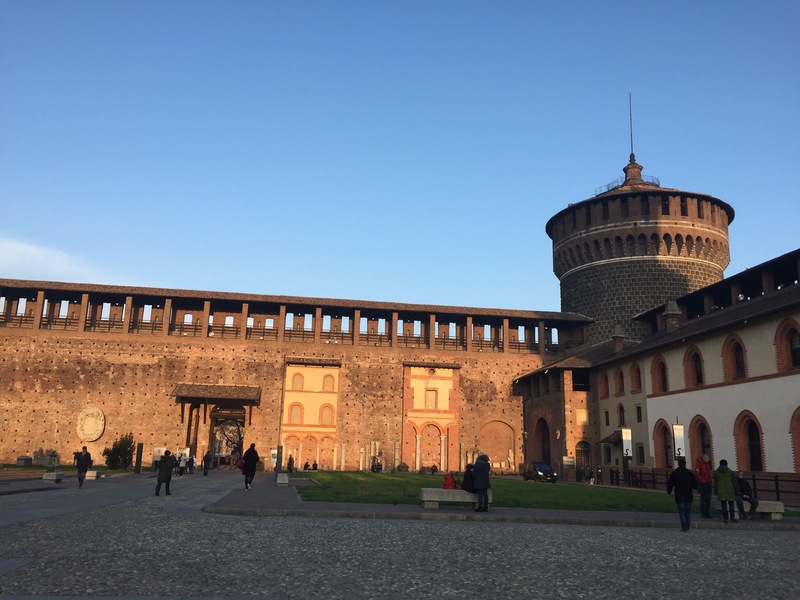 The whole complex was originally built as a fortification in the 14th century but throughout the long and complex history of Milan several demolitions and reconstructions have been carried out. Significant credit was given to members of the Sforza family especially two Dukes of Milan who made radical changes to the castle. Francesco Sforza ordered the construction of the 70m tall Filarete tower while Ludovico, one of his successors, gave the interior decoration work to the greatest artists of his time including Leonardo da Vinci. 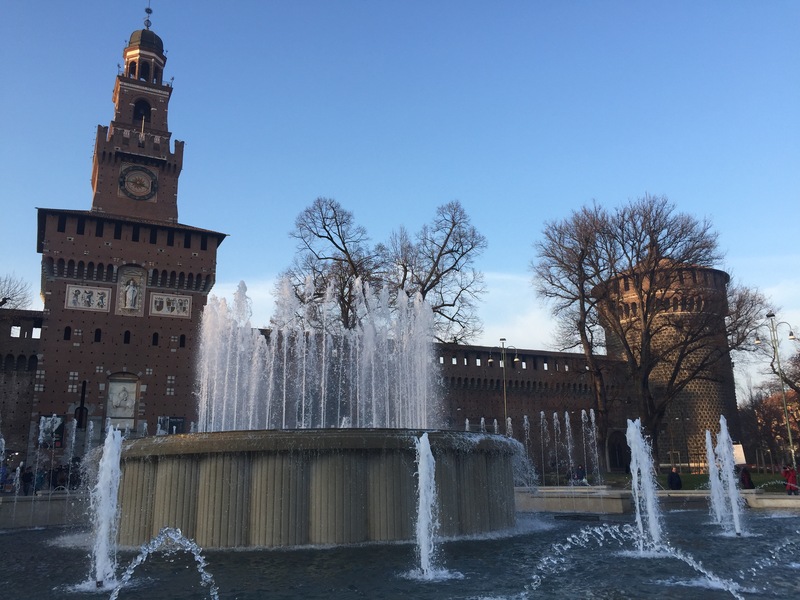 Nowadays Sforza castle shelters several museums and art collections inside, of which the most notable works include the Sala dell Dasse by Da Vinci and Michelangelo’s unfinished sculpture of Pietà. All of them have free access every Tuesday after 2pm but if you can not make it the admission prices are not that expensive for budget travelers. Each costs 5 euros for general audience and 3 euros for students. Through the castle’s courtyards I leisurely walked straight on to reach another vast open space — the Sempione Park. It has a romantic English garden look with a large pond, classic fountains and green meadows dotted with monuments and sculptures. Adjacent to the medieval castle, it shouldn’t be a surprise that the park has been around for more than a century. The stroll brought me to a short iron bridge with four charming mermaid statues, which seems to have its own interesting story to tell. This monument is nearly half a century older than the park itself, initially built as a pedestrian bridge over a canal near Vimodrone (where I’m living) but later moved to the heart of Sempione Park in 1930 as part of a larger preservation effort. It’s also known as the bridge of the Ghisini sisters because the bridge was made out of cast iron (ghisa in Italian). A short while after the sunset, the entire landscape turned to a dominant hazy grey and brownish palette. As the air temperature went below freezing I walked faster towards the northern end of Sempione for a closer look at its unmissable monument – the Arch of Peace. Its decorated features seem sophisticated from what I could see but the position of eight bronze horses embodies a more intriguing story. In 1807 under the Napoleonic ruling the sculptures were meant to face Paris so that the arch would become a new entrance gate to Milan. Unfortunately, Napoleon was soon defeated by the Austrians and the horses were turned 180 degrees back to make fun of his fall. Since that afternoon I would make my way back several times just to relax on a wooden bench, enjoy the last sun rays of the day or stroll along a more deserted pathway to hear the sound of dry leaves crackling under my feet. Sometimes there may be something new to discover like a contemporary sculpture in one of those corners. Like an open book, the park and its hidden secrets would never bore me. Lovely post. Reading your post on Milan reminded me of my visit to Milan many years ago. By the way, did you visit the monastery with Da Vinci’s Last Supper painting on the wall at the dining room?